Beautiful, 3300 acre Lake Elsinore beckons visitors to its shores to enjoy boating, wakeboarding, fishing, water skiing, windsurfing, sunbathing, picnicking or just playing on the beach. The beautiful Ortega Mountains rise above the lake to create a memorable view that you will remember for a lifetime. 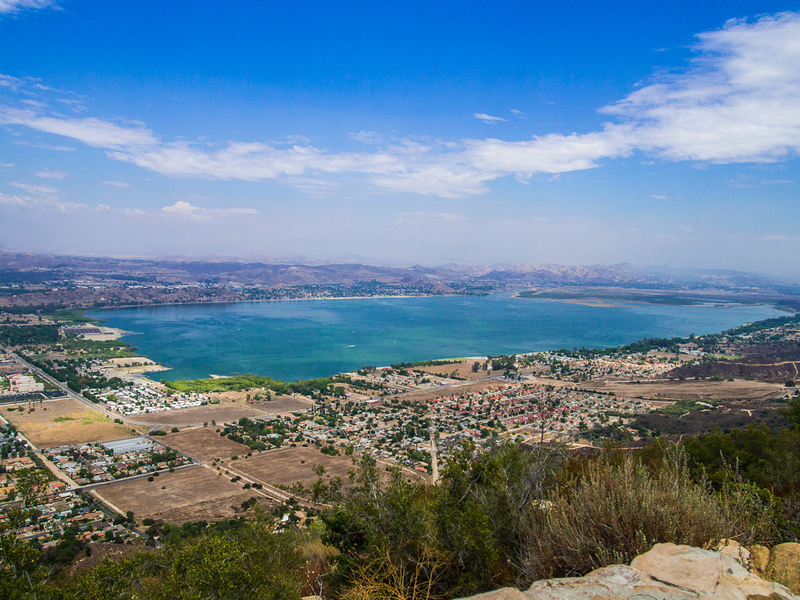 Lake Elsinore is famous for the warm thermal winds that blow in from the neighboring Ortega mountains, and has become a major center for skydiving, hang-gliding and other aerial sports. Lake Elsinore is a favorite venue for daring (or not-so-daring!) jet ski and waterski fans. Skydiving, hang-gliding, skateboarding, motocross racing, waterskiing, jet skiing . . . You name it Lake Elsinore has it! Lake Elsinore is a shopper's paradise. There are shops and boutiques offering fine apparel, arts, and handicrafts, gifts, T-shirts, souvenirs . . . everything you need for fun in our recreational paradise. The Lake Elsinore Outlets provides nearly 100 stores offering top brand-name merchandise at extraordinary values. You can also stroll the historic downtown district and search for rare finds in the numerous antique shops. With a newer Costco and the many stores that surround it you can find whatever you need. The diverse culture of Lake Elsinore Valley is reflected in its diversity of restaurants. From quaint cafes with Main Street charm or to the more sophisticated Italian, Thai, and Mexican specialties. Any appetite, range of prices and style of restaurant can be satisfied! Lake Elsinore is home to the Lake Elsinore Storm, a minor league baseball team. It is a Class A– Advanced team in the California League, and is a farm team of the San Diego Padres. The Storm plays its home games at Lake Elsinore Diamond (Pete Lehr Field), which opened in 1994; the park seats 7,866 fans. This team relocated three times and has been traced back to the Redwood Pioneers, then the Palm Springs Angels, and finally the Lake Elsinore Storm. Established as a city in 1888, the city has grown from a small resort town in the late 19th century and early 20th century to a population of over 51,000. From the beginning, the mineral springs near the lake attracted visitors seeking therapeutic treatments. In 1887, the Crescent Bath House, now known as "The Chimes", was built; it still stands in historic downtown and is a registered national historic site. Lake Elsinore was a popular destination in the first half of the 1900s for celebrities to escape the urban Hollywood scene. Many of their homes still stand on the hills surrounding the lake, including Aimee's Castle, a unique Moorish-style house built by Aimee Semple McPherson. Also, actor Bela Lugosi, known for his lead role in Universal Pictures' film, Dracula, built a home that still exists in the city's Country Club Heights district. The lake also hosted teams for Olympic training and high-speed boat racing in the 1920s. The lake went dry in the mid-1930s, but refilled by 1938. During World War II, the lake was used to test seaplanes, and a Douglas Aircraft plant making wing assemblies for B-17 bombers was located in the city. Rapid population growth in the mid-2000s altered the appearance and image of Lake Elsinore from a small lakeside town of 3,800 people in 1976 to a bedroom community of upper middle-class professionals. The city was ranked as the 12th fastest growing city in California between 2000 and 2008. Formerly open hillsides have been converted into housing tracts. With 203 new home communities currently under construction, it offers something for everyone.